Exercise Rocky Blue began with the excellent book ‘Undaunted Courage’ by Stephen E Ambrose which provides a fascinating study of the Lewis and Clark expedition of 1804-1806. 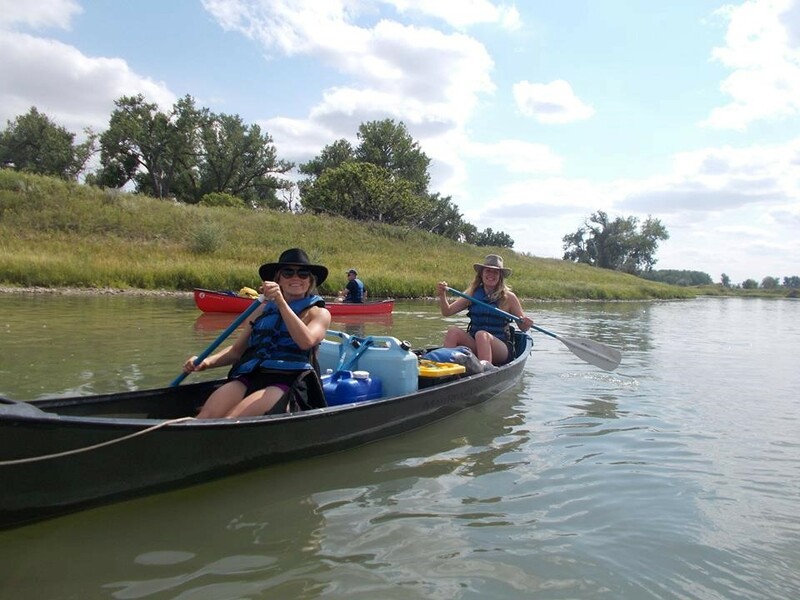 Inspired by the adventures of those pioneering gentlemen, Cambridge University Officer Training Corps planned and organised an expedition to re-trace part of their route along the Missouri River. 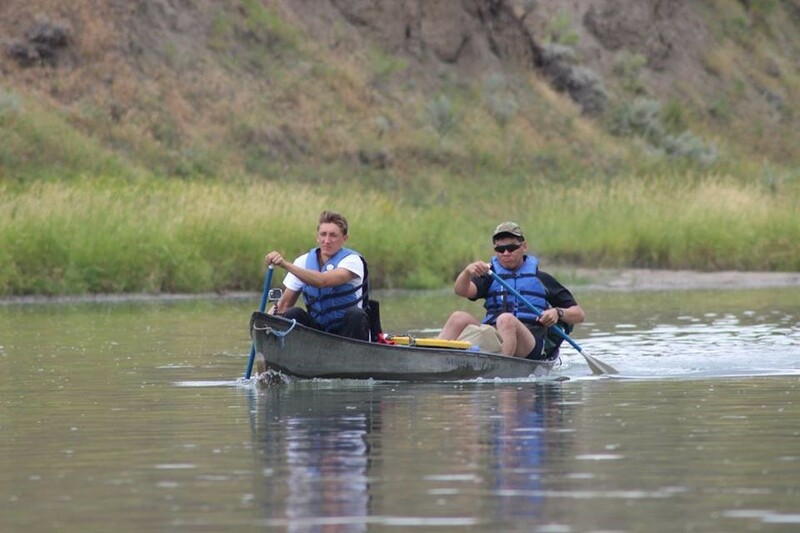 The aim of the expedition was to provide a unique opportunity for a group of Officer Cadets to develop their leadership, canoeing and self-reliance in the thoroughly unfamiliar setting of the Missouri Breaks. Our journey took us to Calgary before travelling south across the Canadian border into the USA. Our drive took us across open prairie, through the foothills of the Rockies where the road wound between forested slopes scarred by forest fires before entering the undulating grassy prairie of Montana. We were based in the town of Great Falls where we were due to stay before beginning the canoeing phase of the expedition. This gave us an opportunity to practice our camp routine as well as allowing us to visit the Lewis and Clarke interpretative centre here. 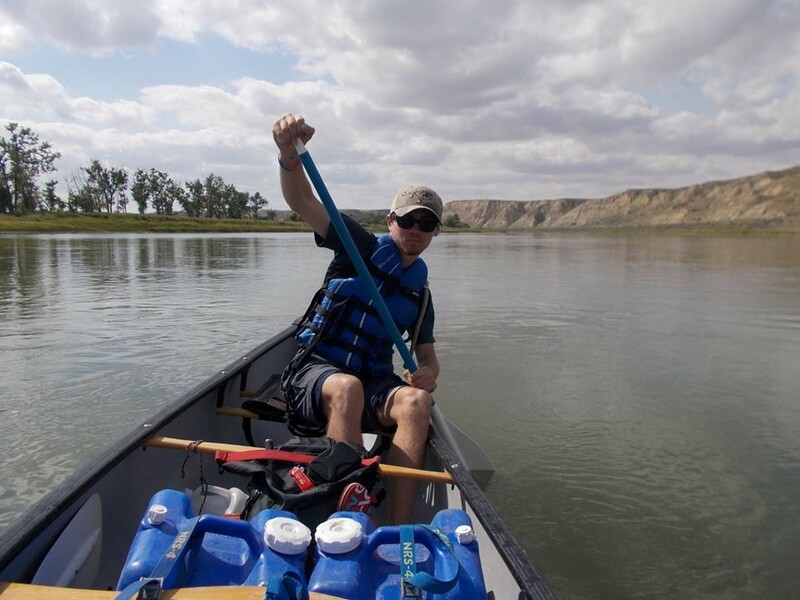 We gained further insights into the original expedition which saw a team of 33 travel over 7000 miles along the Missouri river across land that had never been visited by Europeans in order to find a route from the Atlantic states to the Pacific coast. Our real journey began at the Coal Banks camp site and spent our first day getting used to our canoes. I’m sure our activities which included a lot of circling in mid-stream, splashing and discussion of technique would have amused any observers but we soon settled down to a steady paddle that took us almost 20 miles to our first camp site. The following days saw bright blue skies give way to grey clouds and a mist that followed us up the river before engulfing us in torrential rain. As the storm raged we moved to a clump of trees on the bank where we constructed a simple shelter and watched spectacular lightning play across the hills. When the rain eventually slackened we made our way to the Eagle Creek camp site where we took advantage of a sunny spell to dry our clothes and explore the area. 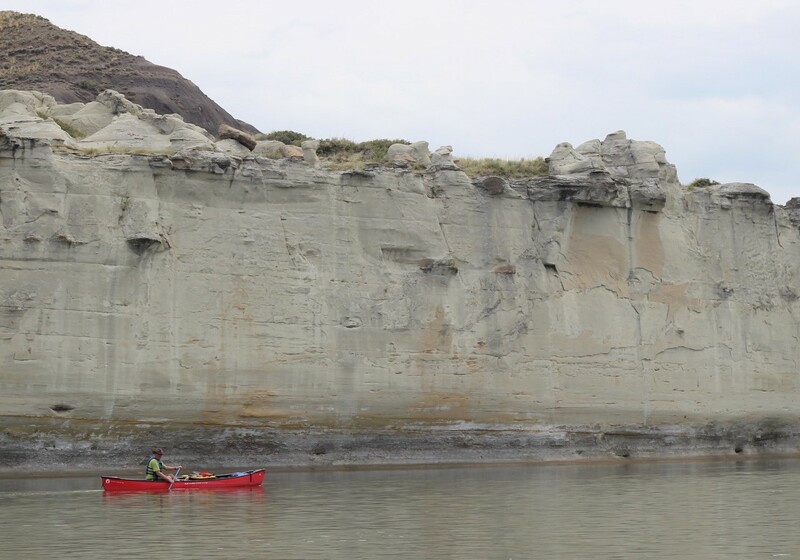 We were travelling through the ‘White Cliffs’ region famous for its spectacular rock formations which were described in the journals of Lewis and Clark as looking almost like statues and cathedrals. Eagle Creek camp site sits beneath a cliff of white rock and a short walk down a nearby track allowed us to explore a tangled network of water carved gorges. As we approached the mid-point of our trip we were aware of the spectacular wildlife living along the Missouri including an osprey, deer and golden eagles. During our time on the river we were also lucky enough to see several bald eagles and river turtles who seemed quite content to watch us as we paddled quietly by. Our camp site at the end of Day 4 proved significantly more developed than previous locations providing us with fresh drinking water, a solar shower on the bank and (luxury of luxuries) wifi access! From this point on we were moving into some of the more isolated sections of the river with our camp sites located more than 20 miles from the nearest road. The weather remained warm: however we paddled in an orange haze created by the smoke from far off forest fires. The peace and calm of the river and the quiet of the camp site gave one a sense that we were far from civilisation. In the following days we continued to practice canoeing techniques including building a raft with a sail to take advantage of the blustery wind which carried us safely to our end point at James Kipp Landing. The final phase of the trip took us to Banff National Park in Canada for some well-deserved rest. 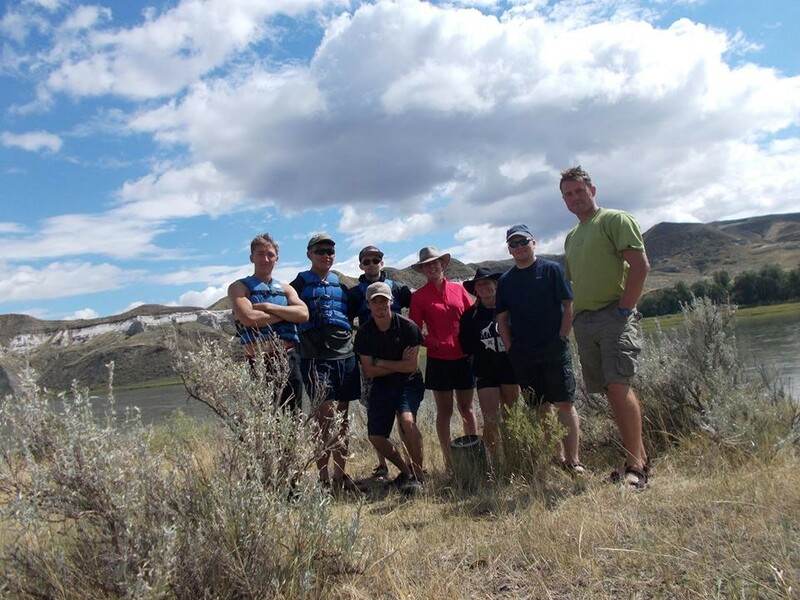 Members of the group were able to enjoy a range of activities including a pony trek around the local area and a visit to the natural hot springs in the mountains before returning to Calgary for our flight home. Travelling the route of Lewis and Clarke was a fantastic experience, particularly with so much of the landscape remaining virtually untouched over the last 2 centuries. It provided the participants with a taste for canoeing and left some of us keen to develop our watermanship skills further in the future.